The carvings offered few clues as to the stone’s origins. 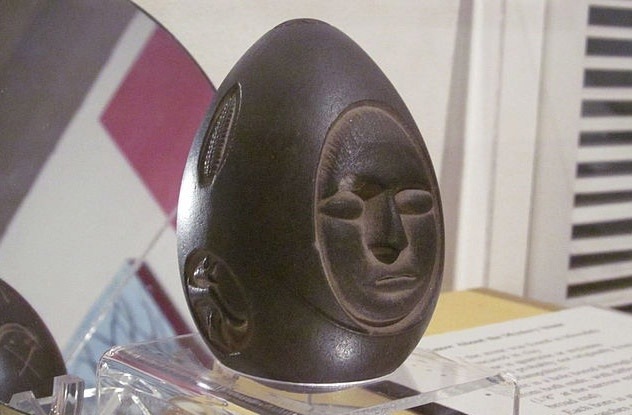 The front of the egg shows a face. There’s an ear of corn on the side, a circle containing depictions of animal parts, a spiral, a crescent moon, and various patterns made of lines and dots. There are holes drilled into the top and bottom, which are too regular to have been created by pre–19th century technology, suggesting the stone was crafted not long before it was found. No one recorded details about the stone’s discovery. We don’t know the exact site where it was found or how deep it lay. The type of rock it’s made from isn’t usually found in New Hampshire. After close to 150 years of investigation, we know no more than this: Someone created it for some reason at some point and it ended up buried.